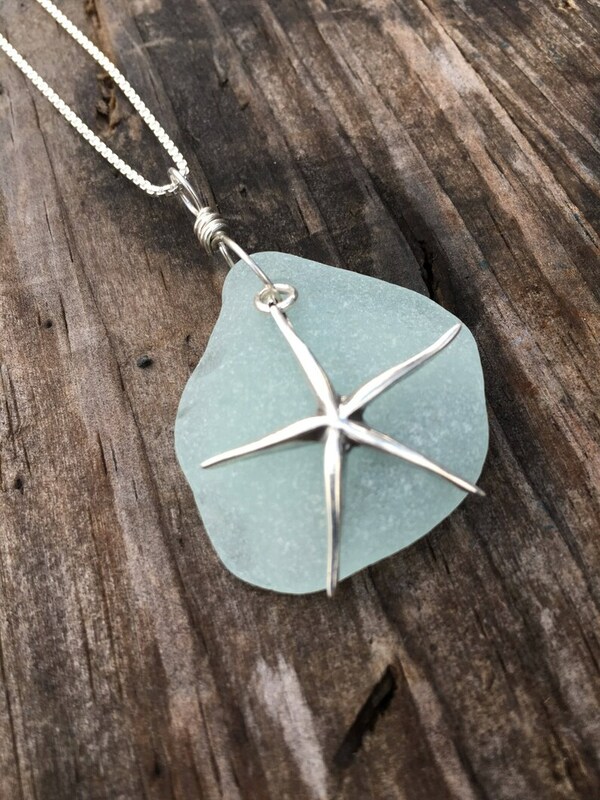 Handmade light green sea glass necklace with a sterling silver starfish that sits on top. Chain is a sterling silver and is available in 16" or 18" -- please specify in the comment box during checkout. Enjoy summer all year long with this beauty! The design of this bracelet is quite unique. The gold binding of the silver pieces is interesting and novel. I absolutely love it!!! Oh my goodness! I'm never taking it off! I love it! Better in person! Shipped to me very quickly! Lovely product! The stones are beautifully presented! FYI, I purchased similar pebble earrings from another vendor - but the glue they used did not hold up to even one use. So far so good with these! I accept Paypal, Mastercard, Visa, money orders and personal checks. Once your payment has cleared your item will be shipped. Payment must be made within 3 days of purchase. Most items are made for you personally and will be sent out within 2 weeks of payment. I accept exchanges for items purchased of the same or greater value. I do my best to describe the items I am selling and show photographs that represent them. I would be happy to exchange your item within 7 days of purchase. Purchases will be sent via the U.S. Postal Service with insurance in the U.S. Buyers from other countries, please be aware that there may be an additional fee in your country and unfortunately, it is not something that the seller has control over. See the explanation from this link which is an example of duties in the UK -- there may be similar duties in your country so please research and make an informed purchase. WHOLESALE orders are always welcome and encouraged! Please contact me at thegildedlilystore@comcast.net for wholesale pricing. FEEDBACK is an important part of each sale, please contact me first if you are dissatisfied with your purchase so that we can work together to fix it.